Property Casualty Insider » Does Politics Influence Regulatory Forbearance? Does Politics Influence Regulatory Forbearance? Voters and politicians hope that elections matter, but it isn’t always clear how much they matter and what the real effects elections have on voters and the economy. Researchers looking at developing economies look at how elections relate to the number or timing of bank insolvencies. They hypothesized that troubled banks were declared insolvent after elections to increase the likelihood of a successful election for the party in charge. They find modest evidence that elections affect regulatory actions, but the problem is that there are really so few elections and the decision maker (the president or prime minister), while an important decision maker, does not really have direct oversight of the banking industry. My coauthor, Ty Leverty of the University of Iowa, and I thought about this problem a bit and decided to put this question to the US insurance industry. We thought the insurance industry would be a great laboratory for this study for a number of reasons. First, we have a very mature market in a well-developed economy. Second, we have among the best regulatory practices worldwide. Third, we have a regulatory philosophy that allows insurance companies to fail –essentially because failure and a subsequent wind-up is cheaper in the long-run than propping up an ailing insurer. Fourth, we have the insurance industry regulated at the state level – so this gives us 50 different governments to examine. Fifth, we have a selection of oversight models at the state level. Some regulators are elected, some are appointed by the governor, and some are selected by the legislature. Sixth, the NAIC and the states, reacting to Federal pressure, made modifications to state solvency law requiring regulators to intervene if insurers risk based capital fell below a given level. This removal of discretion provides a natural experiment that allows us to look at how regulatory governance can influence electoral delay. Finally, over the time period of our study we had 321 elections over a 21 year period with some 260 insolvencies. If regulators intervene to minimize social costs rather than seeking their own interests or pandering to pressure groups wishes, then the data should show state regulators were effective in monitoring insurers, and that behavior should mimic that of well-informed market participants. That is, insurer failures should be determined solely by the insurers’ health and economic conditions. Alternatively, regulators might be reluctant to take over failing insurers promptly if it would negatively influence their own political goals. The question on everyone’s mind is whether elections provide incentives for regulators to forebear on their duty to intervene in a troubled company. Several reasons come to mind why regulators may delay intervening before an election. First, public officials might face questions about their competency when firms under their watch fail and thus have an incentive to pander to voters by deferring action until after elections. Second, public officials desire to generate favorable economic news prior to elections. Third, the costs of closing a company fall on a relatively small group with strong interests in the outcome (the owners, employees, and customers), while the benefits, such as a healthy industry and economy, are widespread, making public officials possibly more susceptible to interest group pressure before elections. Since we have many reasons for possible regulatory delay, what does our evidence say? Figure 1 shows the basic story. The total number of regulatory interventions (receiverships, conservatorships, and liquidations) decline right before an election and experience a jump in the six month period right after an election. 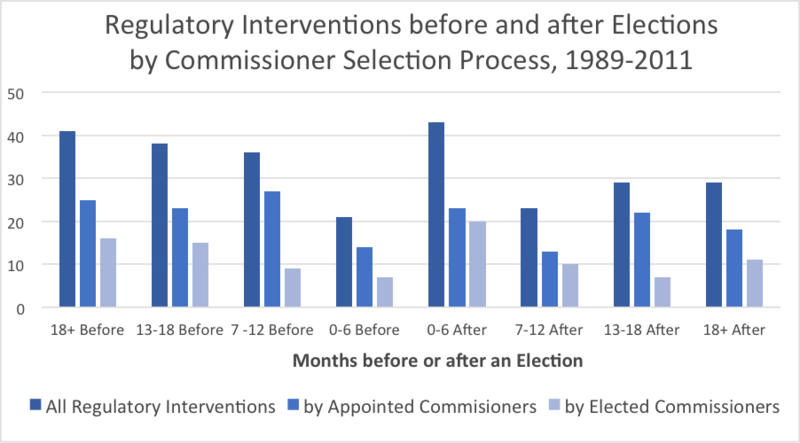 If we think that politics has no effect on the timing of regulatory intervention, then the distribution of the interventions should be equally spaced or about 32 per period. However, we see that right before the election the number of interventions is 21 and right after an election it goes to 43. 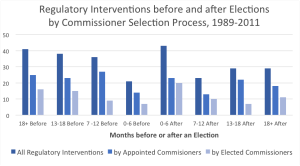 Upon further analysis it looks like the elected commissioners (accounting for 36% of all interventions) have the greatest change between the period before and after an election. We would expect to see approximately about 12 per period if politics had no influence on the timing of interventions, and we see that prior to an election there are 7 and after an election there are 20 interventions. This is a dramatic and statistically significant difference. For appointed commissioners the respective numbers are that we would expect to see 20 on average in each period, yet we see 14 prior to an election and 23 after an election. The difference between before and after here is barely significant using standard measures. 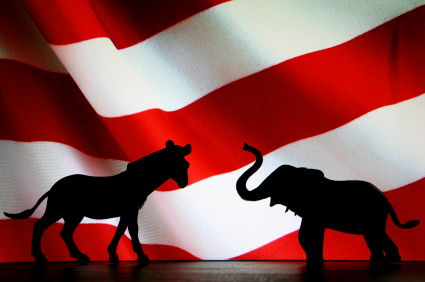 We also examine whether the competitiveness of the election matters. Some insurance commissioner and gubernatorial elections are tight and some (especially at the insurance commissioner level) are unopposed. Does the level of election competition have any influence here either? We find that it does. For example, one could believe public officials have less of an incentive to pander to voters if they are likely to be elected with ease. The incentive to pander to voters, however, should be particularly acute if elections are competitive and not losing votes is particularly valuable. We find that electoral delays increase by 34 percent before tightly contested elections. Appointed regulators delay interventions before competitive gubernatorial elections, but do not delay interventions before elections in which the appointing governor is likely to be elected. In contrast, elected regulators delay interventions before all elections, regardless of the competitiveness of the election. A further question arises which we can answer with our date. Are there regulatory governance mechanisms which can mitigate the delay problem caused by elections? Risk Based Capital (RBC) was implemented in 1994 and mandated that regulators take prompt corrective action against insurers with low levels of capital. The intent of the law was to reduce the discretion of regulators in when and whether to intervene in failing firms. We find that the mandate restrains electoral delays and it is especially effective in reducing the discretion of appointed regulators. Thus, the governance structure of the regulatory system is important in constraining regulatory discretion. Finally, we study whether the ultimate costs of failure increase because of the inaction induced by elections. Prior studies investigate the cost of resolving bank and insurer insolvencies, but this is the first study to examine whether political incentives increase the cost of insolvency. We find that election induced inaction increases the ultimate costs of failure by 68 to 97 percent. This is especially important as insurance company failures are generally more costly than banking failures when measured on a similar basis (FDIC contributions or guarantee fund assessments to pre insolvency assets). So using a system that has elected and appointed commissioners, elections at differing times, the presence or absence of elector competition, and an outside event that changes the ground rules for solvency regulation (RBC), we see that political institutions do matter and that regulatory delay can be political motivated. We also see that regulation can be governed in such a way as to mitigate some of the excess of the political considerations and influences bought about by elections. We provide evidence about how regulatory supervision can be politicized and what kinds of institutions might be used to provide adequate incentives to regulators to achieve better supervision. If regulators are pursuing their narrow private interests, rather than social interests, then it is possible that the promotion of market discipline (via an uninsured debt requirement and/or the systematic public disclosure of information) and/or the placement of constraints on regulators are more likely to foster a robust insurance sector than government-led regulation alone.